Answer: I know exactly what you’re talking about. And your observation that this happens more often during hot weather is correct. We see these things all the time here in sunny Arizona. It’s the air temperature gradient over the solar-heated road that causes the illusion. But this is not really an “optical illusion.” Technically, the term optical illusion refers to a broad class of phenomena, all of which all happen entirely inside your head. With an illusion, your eye-brain system is being tricked by geometry or color. For an excellent explanation, read more here. What’s happening in this case is called a mirage, specifically, an inferior mirage. The “inferior” refers not to its quality, but to its position below the real object. This phenomenon occurs outside your head, and is a result of light rays changing direction, or being “bent.” In fact, what you’re seeing in these highway mirages could just as well be caused by a large mirror set horizontally on the pavement. I shot the photo above on a long flat road in southern Arkansas. It was hot that day, and the mirage was especially strong. [By the way, you can photograph a mirage, but not an optical illusion.] The “water” on the road is clearly visible, and note how you can also see “reflections” of the headlights and tree trunks below the actual objects. In a mirage, light rays are changing direction not because of reflection (which is what a mirror does). They’re changing direction because of refraction (which is what a temperature gradient does). The speed of light depends on what it’s going through. In the vacuum of space, that speed is exactly 299,792,458 meters/second (about 186,000 miles/second). But light moves 0.0008% slower in air, and slower still through cooler air (which is more dense). The bottom line is: A temperature gradient in air causes light to veer toward the cooler air. If you really want to understand the physics behind that effect, you can learn more about it here. The graphic shows what’s happening. 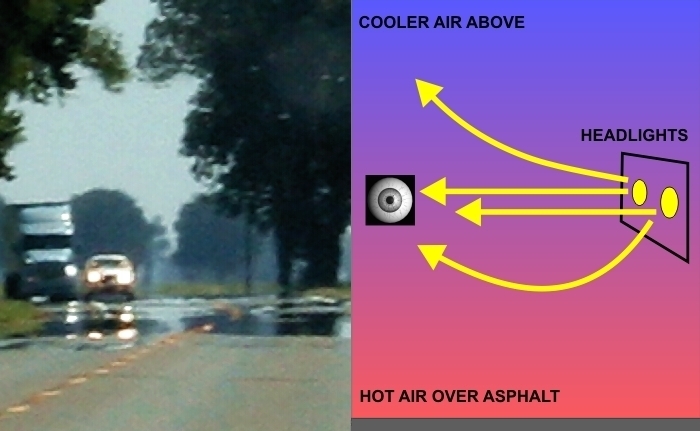 Air near the pavement can be 10-20 degrees hotter than air farther up. This temperature gradient “bends” the light rays that would otherwise hit the pavement, and directs them to your eyes. So you see blue sky (water), extra headlights, and upside-down tree trunks on the road. The amount of “bending” is exaggerated in the graphic — it normally occurs much more gradually, over distances spanning hundreds of feet. That’s why the mirage always disappears as you get closer. Ever been lost in the desert? Then you’ve no doubt had this experience … you see a “pond of water” just ahead. But as you approach, it keeps receding or disappears. That was the same kind of mirage. If you also saw palm trees, then you were privileged to experience both a superior and inferior mirage. More about that in a future post. And if you’re wondering about the right headlight on that truck, yes, it’s really burned out. Even though its light passes over grass, from the camera’s perspective, no likely temperature gradient would prevent you from seeing its direct light.